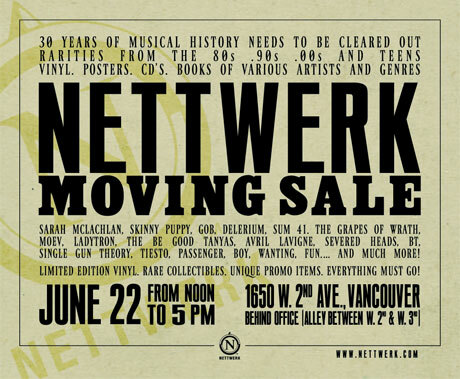 Vancouver's Nettwerk Records is planning on moving its business to a new office sometime in the future, and the record company wants to get rid of some clutter as it is packing up. Lucky for us, that means the imprint is hosting a clearing-out sale on a number of records and rare items. The blowout goes down June 22 at Nettwerk's current office (1650 W 2nd Ave.) and will apparently have the company hocking CDs, posters, books and more from artists like Sarah McLachlan, Skinny Puppy, GOB, Delerium, SUM 41, the Grapes of Wrath, MOEV, Ladytron, the Be Good Tanyas, Avril Lavigne, Severed Heads, BT, Single Gun Theory, Tiesto, Passenger, BOY, Wanting, and fun. The poster, which you can see above, is building a mystery by also hinting at "unique promo items" being up for grabs, which we're hoping includes a trove of "I Heart Deryck + Avril" wedding buttons or a jar full of Theo from GOB's burps. You can find out more about the moving sale here.